Nearly three days after Hurricane Harvey made landfall in Texas, more statewide resources are being deployed to address rescue efforts in Southeast Texas. Nearly three days after Hurricane Harvey made landfall in Texas, more statewide resources were deployed to address rescue efforts in Southeast Texas Monday. Gov. Greg Abbott announced he has activated the entire Texas National Guard in response to Harvey, bringing the total number of deployed personnel for rescue efforts to 12,000. "It is imperative that we do everything possible to protect the lives and safety of people across the state of Texas as we continue to face the aftermath of this storm," the governor said in a released statement. President Donald Trump is set to visit the city of Corpus Christi and possibly surrounding areas affected by the storm on Tuesday. During a press conference Monday afternoon, Trump promised Texans would receive federal funding for rebuilding efforts, and also mentioned he may revisit the state again on Saturday. "The rebuilding will begin, and in the end, it will be something very special," said Trump, adding he had just spoken with Abbott. "They're saying [Harvey is] like the biggest ever. It's historic. It's like Texas. It's really like Texas, if you think about it. Meanwhile, in Houston, first responders are focusing first on helping the elderly, disabled and those in life threatening situations, Mayor Sylvester Turner said during a news conference Monday. He added, "Our goal is to try to reach everyone today and get them out of stressful situations." A family of six was believed to have drowned in a van while trying to escape Hurricane Harvey in Harris County, Houston-based KHOU reported Monday. The news was confirmed to KHOU by three family members but had not yet been verified by local officials. The victims included four children — all of who were younger than 16 — and their great-grandparents, according to KHOU, which reported that the driver of the vehicle managed to escape before the van was swept up in the flood current. 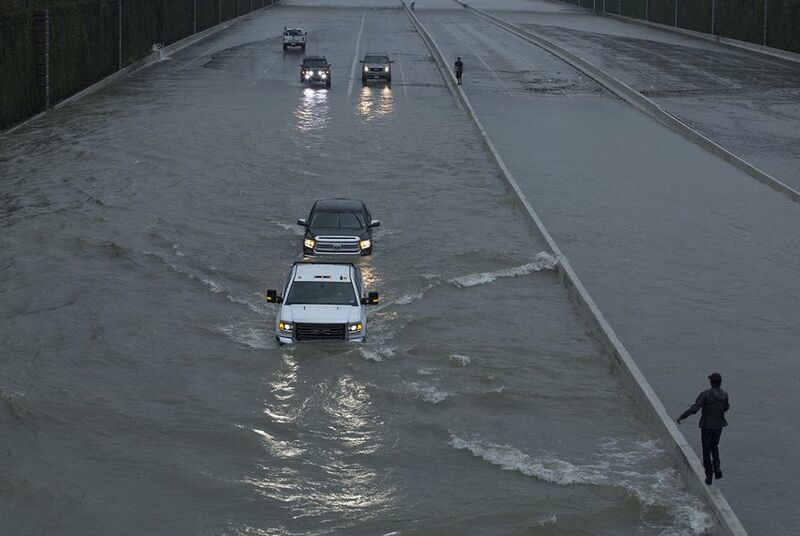 Houston, the fourth largest city in the nation, was one of the many areas in Texas devastated over the weekend — and some parts of the state may receive more than 50 inches of rain in the coming days, which would break state records. After receiving a briefing on the storm Monday afternoon in Corpus Christi, state officials braced Texans for a potentially years-long recovery. "There is a reality we have to come to grips with: We are just beginning the process of responding to this storm," Abbott told reporters. "This is going to be a long haul," added U.S. Sen. John Cornyn, R-Texas. Abbott and Cornyn were joined at a news conference by FEMA administrator Brock Long, who said the agency is prepared to spend "several years" in Texas helping with the recovery. Back in Houston, U.S. Sen. Ted Cruz, R-Texas, told reporters at a Red Cross shelter he had spoken Trump, Vice President Mike Pence and several over federal officials about Harvey over the past several days. "What we're hearing consistently is a commitment to provide every resource needed," he said. "I spoke with the president — he just said, 'Ted, what do you need, what does the state need? The answer is yes.'" For a glimpse into the scope of Harvey's impact in Texas, the 54 counties included in Abbott's Texas disaster declaration make up 41 percent of the state's 27.9 million population. On top of that, the Insurance Council of Texas has estimated Harvey-related damages will top Hurricane Ike's $12 billion clean up in 2008. Relief efforts are continuing around the state, too. Volunteer firefighters in smaller Texas towns are rescuing people trapped by the floods, and shelters in San Antonio and Austin are filling up. Meanwhile, the U.S. Border Patrol said in a joint statement with Immigration and Customs Enforcement Monday that the agencies had deployed several marine vessels and agents to aid in related Harvey rescue missions, adding they would prioritize "life-saving and life-sustaining" operations, maintaining order and the prevention of loss of property. The border patrol also said it would not conduct noncriminal immigration enforcement investigations at evacuation sites or other assistance centers but would stay "vigilant against any effort by criminals to exploit disruptions caused by the storm." In Dallas, Mayor Mike Rawlings announced Monday that the city — home to more than 1.3 million people — would begin receiving evacuees affected by the storm that afternoon. Alex Samuels, Patrick Svitek and Julián Aguilar contributed to this report.